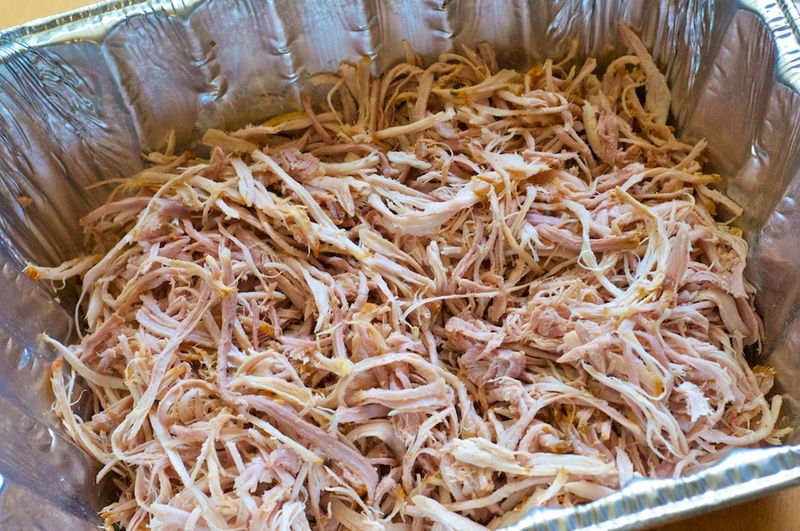 Here’s a recipe for Pulled Pork that I just tried and it was quite delicious. It was given to me by Ruby Lang at work. 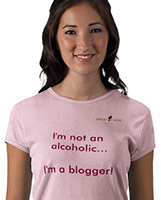 She based her recipe from Nancy Walker’s recipe on the Stephen & Walker Trust Winery site. The wasabi slaw recipe is my own creation that I came up with after some experimentation. The wasabi gives it a little kick that I like. You’ll need to start this recipe the day before your event for it to be ready. It takes time but it’s worth it. Cut onion into quarters and put into a blender. Add vinegar, salt, mustard, and sugar. Blend well. Add oil slowly while blending. Pour dressing into glass jar and then stir in the poppy seeds. Cover and refrigerate. Preheat oven to 350ºF. Combine the garlic powder, lemon pepper, seasoning salt and cayenne pepper and rub the pork. 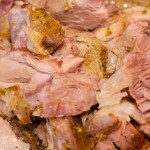 Place the pork, skin side down, in a large dutch oven or a heavy roasting pan. Add ¼ cup water to prevent scorching. Seal the dutch oven with a layer of aluminum foil under the lid or cover the pan tightly with foil and cook in the oven at 350°F for 4 hours. 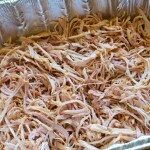 Remove from the oven and allow the pork to cool in the pan (about 5 hours), refrigerate overnight. 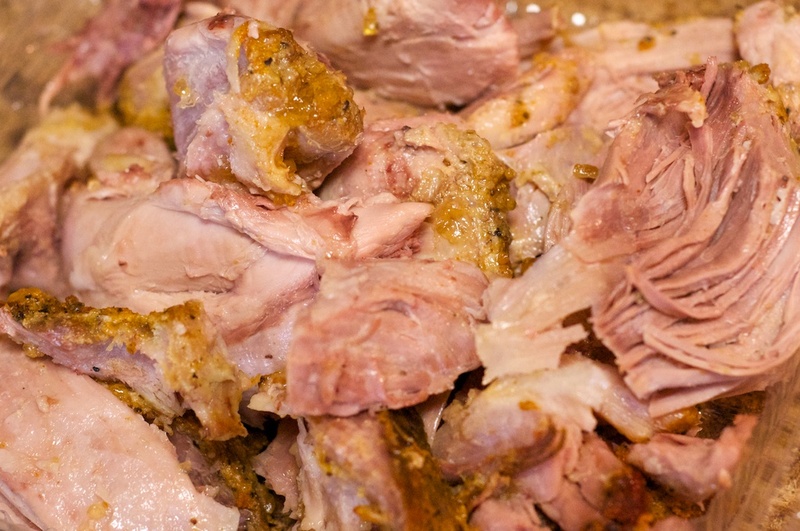 Next day, use your hands to pull the pork apart removing the skin, fat and connective tissue. Discard any liquid in the pan as well. Combine poppy seed dressing and wasabi, mix thoroughly. Add to cabbage and toss. Cover and refrigerate. While shredding the pork into strips (see photo), make the sauce. 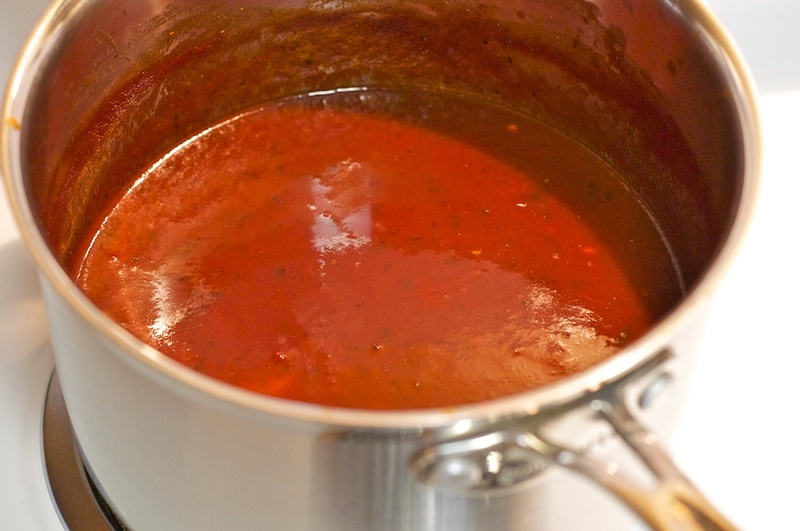 In a large saucepan, combine the sauce ingredients and reduce for about 2 hours on low heat, stirring occasionally. It should reduce to about 2 – 2½ cups. 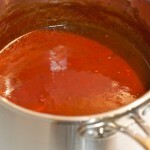 Strain the sauce, if desired, and add it to the pulled pork. 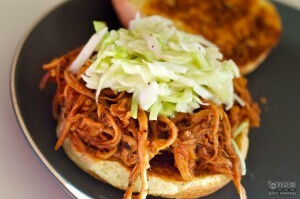 Reheat the pork until warm and serve on a toasted onion bun with generous spoonful of slaw on top. I can vouch for this pulled pork. Amazing. And the Poppy/wasabi slaw was the perfect kicker to top it. Where is the pie recipe? Thanks for being my guinea pig. I haven’t posted the entire pie recipe yet, just bits and pieces of it. Eric, thanks for posting this killer recipe. Pulled Pork is a classic favorite of mine. Especially with Zinfandel. Hope you’re doing well. Cheers!